Thanks to all of you for your prayers for all of us, support, and kindness. I feel like so much of the last few years since my pregnancy with Sammy has been such a roller coaster ride. I have come to rely on God and learned to trust Him more than ever before. And I am so grateful for that. I am grateful that God has placed so many people in our lives that keep reminding us to trust in Him and that He truly knows and sees all. Although the last week was so stressful and emotionally draining, it was wonderful to be reminded of God's love from so many who reached out to help in so many ways. I thank you all, for your prayers, for your love, for your comments here and through email, for taking care of Sophia, and for countless other things. My sister in law introduced me to a truly beautiful song called Trust Me, a few years ago. She sang it after I had my miscarriage, and then again at Sam's dedication. I listen to that song often to remind myself that God is in control and that He knows ALL. When your down and stressed out remember that God is with you through it all, and He is just waiting to lift your burden. Please continue to pray for Sam as we continue to work towards figuring out what is going on with him. We are fortunate to be seeing a new specialist who it usually takes several months to get an appt with in october. 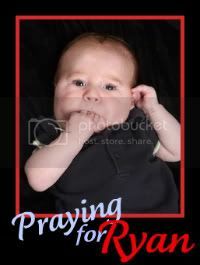 Please pray for wisdom for this doctor and for strength and health for Sammy. 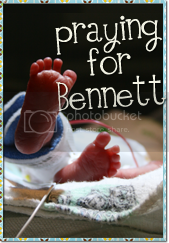 Praying that there is no more blood in his poop would be great too!!! God bless you all. Thanks for commenting on my blog. I've read a little bit about your family but unfortunately my 3 year old is crying in my lap right now because it is her bed time. I promise to come back and read more. I will pray for your little boy. I hate seeing kids in the hospital. It is so sad. In answer to your question, yes, I have been a nurse for 5 years and I love it. I hope you get the answers you have been searching for. I am so happy the procedure went well, and Sam handled it as well as he did. He is a very strong boy. Please keep us updated with any new information. We pray it is all good news, but that you do find answers.